Every Monday at Concourse Hall! Class and practices are every 1st and 3rd Monday of the month! At 8 PM Melissa and Chris will be leading a group footwork warm-up, followed by a connection exercise. At 8:10 PM we will split into two tracks: WCS 1 and WCS 2. WCS 1 – Is a beginner WCS lesson that introduces dancers to basic concepts, movements and patterns of the dance. WCS 2 – Participants must know the basic patterns of the dance..The lesson will introduce a concept in the first half, and then build on it with an intermediate pattern and technique. At 8:50 PM – Dance Rotations begin. Rotations combine WCS 1 & WCS 2 classes to dance with each other through a guided rotation. Each rotation will last about a minute to a minute and a half. At 9 pm there will be a Group Practice where everyone will be able to dance and get feedback/assistance from instructors and other dancers. 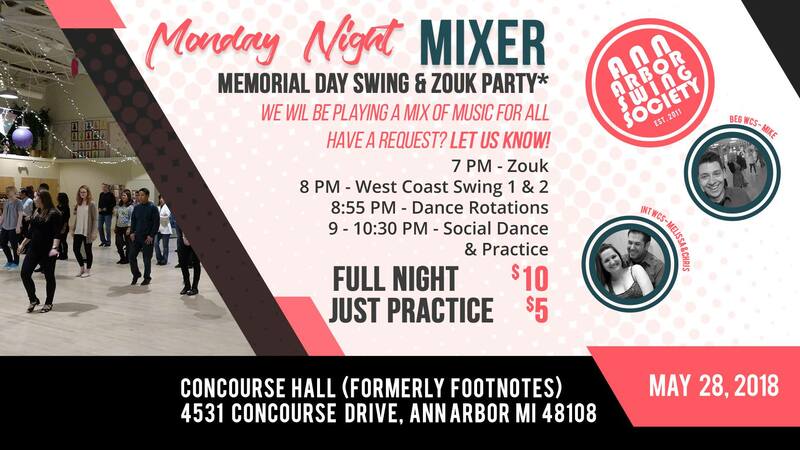 The goal is to work as a group to improve our dancing ability..
For those that are unfamiliar with Concourse Hall, Concourse drive is off of State Street by the Ann Arbor Airport. You will take a winding road about 1/4 of a mile down and the Hall will be on the left side of the road.